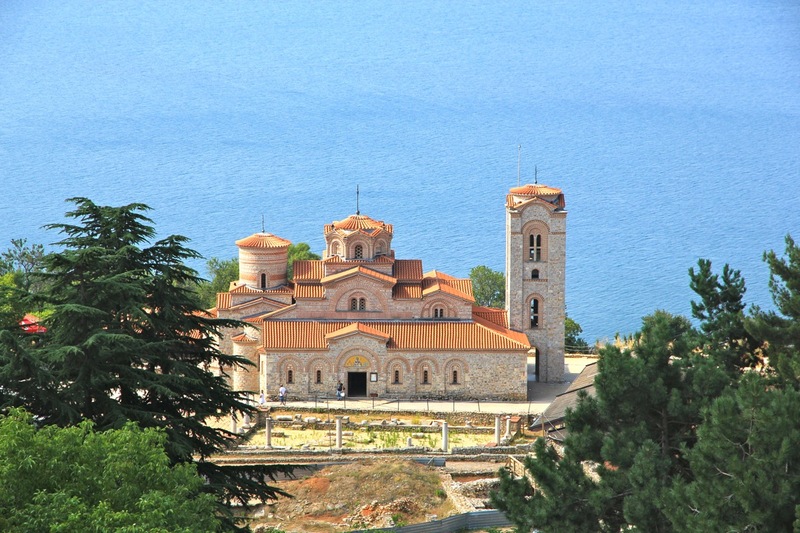 This description is relative to the nice city of Ohrid. 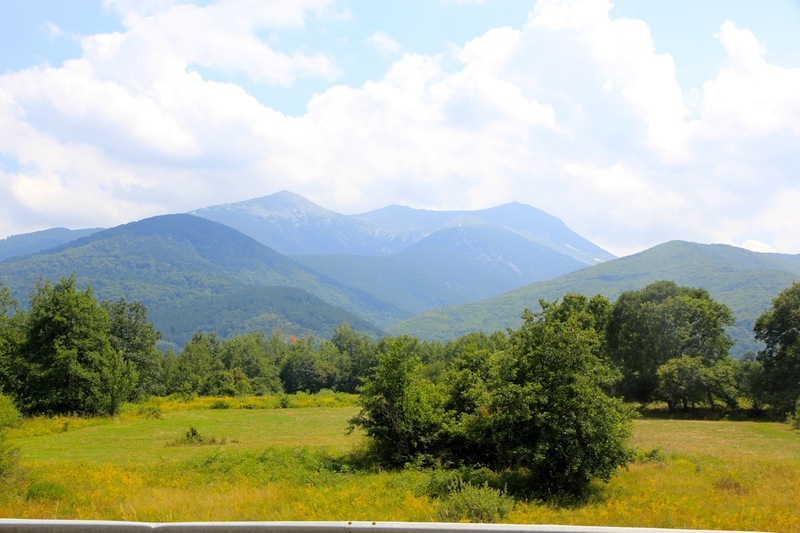 From somewhere near the city center, first drive towards Bitola, 64 kilometer. You will then be on Hwy. M5 heading downhill towards Bitola. Take the first exit for Bitola, there is even a sign on M5 advertising Hotel Molika, just before this exit. The exit is next to a gas station, mesure from here. At kilometer 1.4, you reach another gas station and the first possible place to make a right turn. Do this and head up this road. At kiometer 4.3, take the right branch at the road fork. The narrow, but paved road is steady uphill. 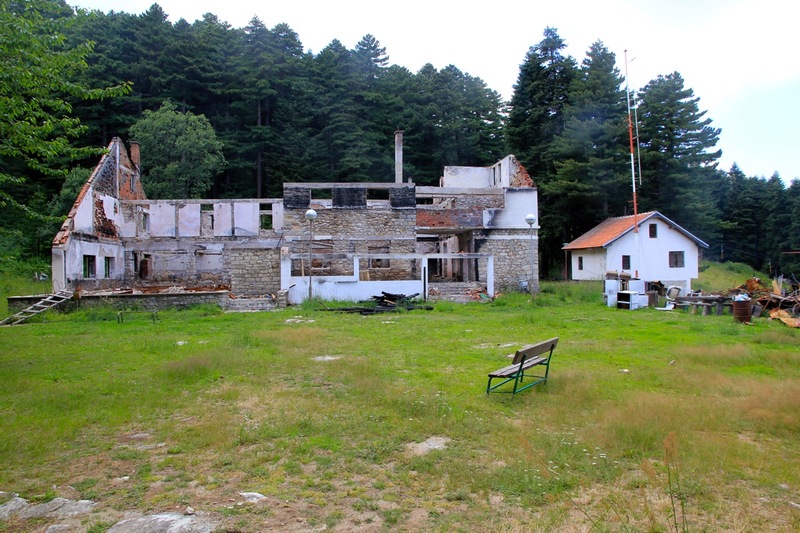 At kilometer 7.4, you are close to the last houses in the village. Continue on the same road as it now makes some switch back turns while climbing higher in the hillside. At kilometer 12.3, you are in a parking area and you have just passed an information center on your left. This location is N41.03950, E021.21873, elevation about 1350 meter. You will note a dirt road that heads right when the main road makes a left turn. 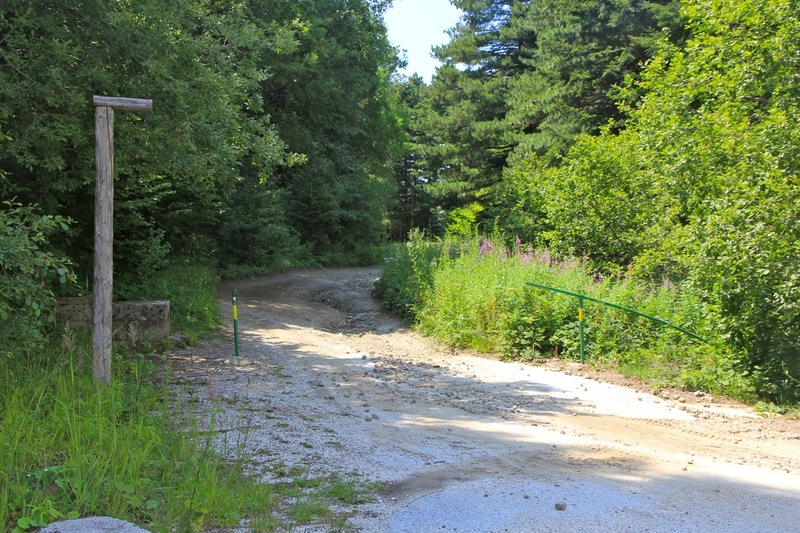 This is the beginning of the road that serves the summit. The paved road continues a few more hundreds of meter to arrive at Hotel Molika, location N41.03583, E021.22652, elevation about 1420 meter. Park here, this is the trailhead. Depending on the route and how you want to do this climb, an alternative trailhead/parking is 70m meter below at the parking near the information center, see the description below. 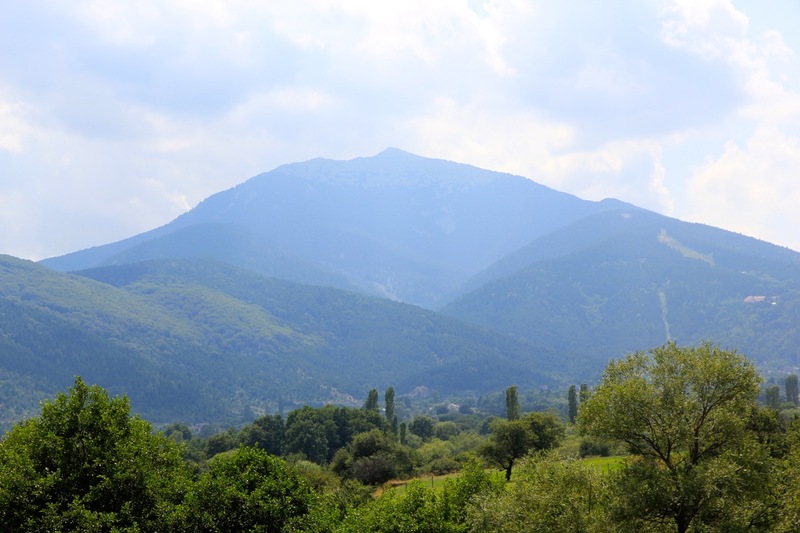 After my ascent, I do feel that I know this peak relative to a northern approach (Hotel Molika) quite well. There are several options. The long and easy option is to follow the road to the summit. Note that this road may be closed to traffic, the gate was open when I was there, but this may have been by chance. One should then start from what I call the lower trailhead/parking (see map below). 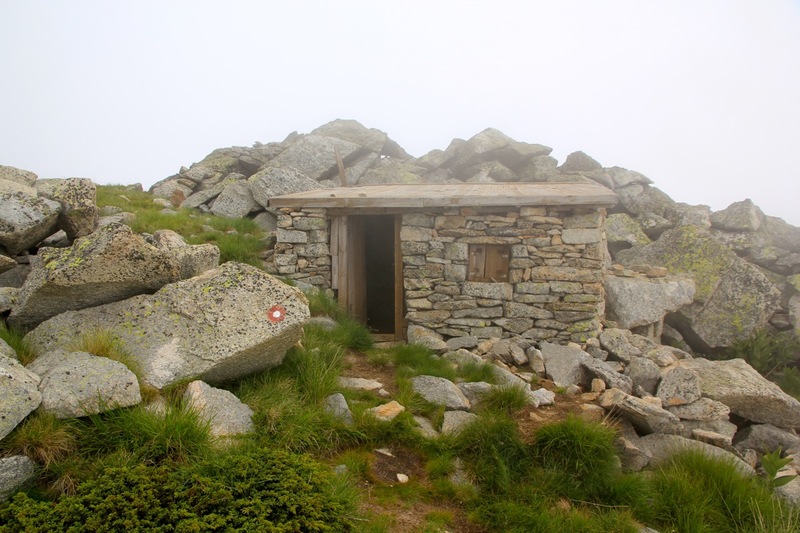 The Kopanki hut burnt down last year and is no longer an option for an overnight stay. 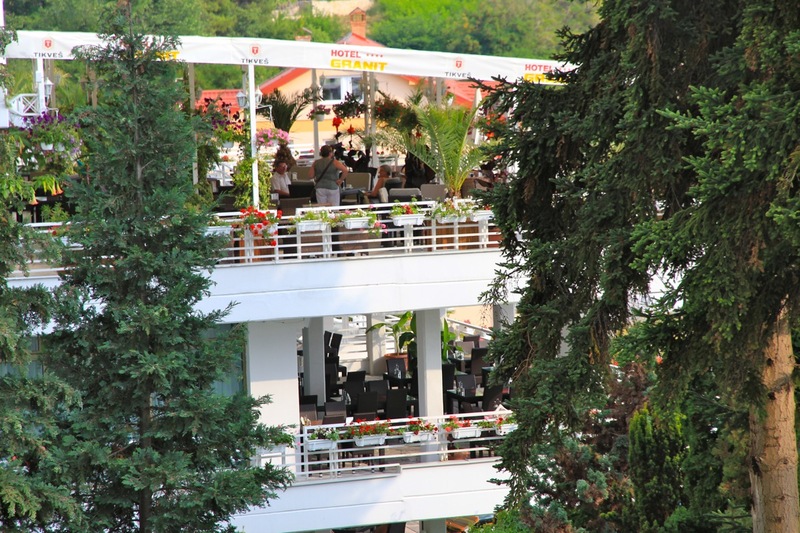 However, the Molika hotel looks like a very attractive place to stay. There are three possible routes that start at Molika and first ascends the nice (and short) path up to the ruin of Kopanki hut. 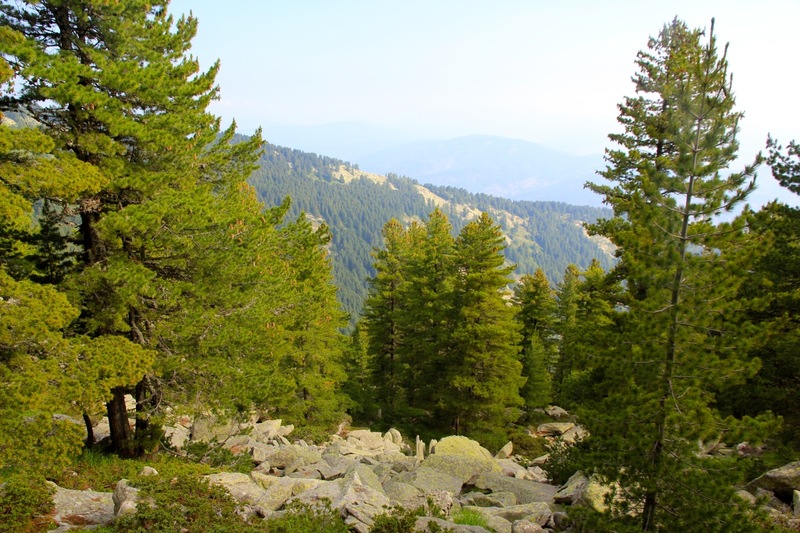 Your first option is to hike this way, then traverse across to the forest road and complete the normal route to the summit. 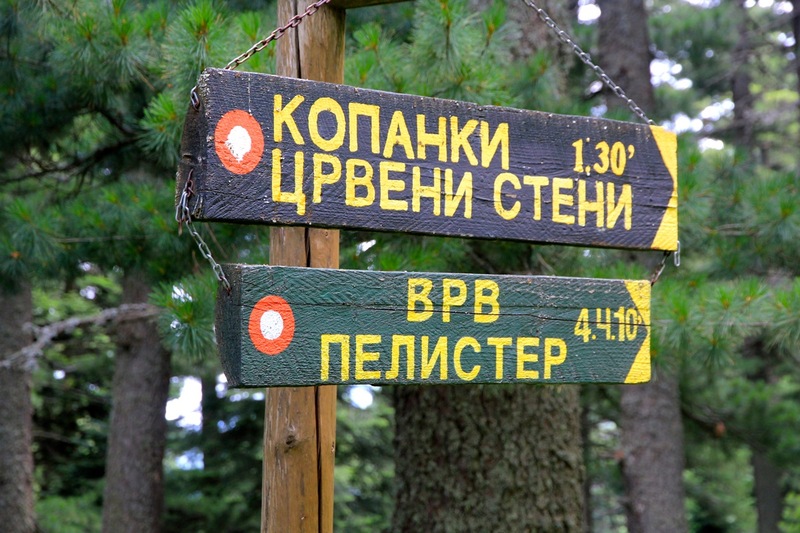 When arriving at the Kopanki hut, cross the area in front of the hut and proceed to the right. A chair lift ends here and a T-bar lift serves the higher slope. 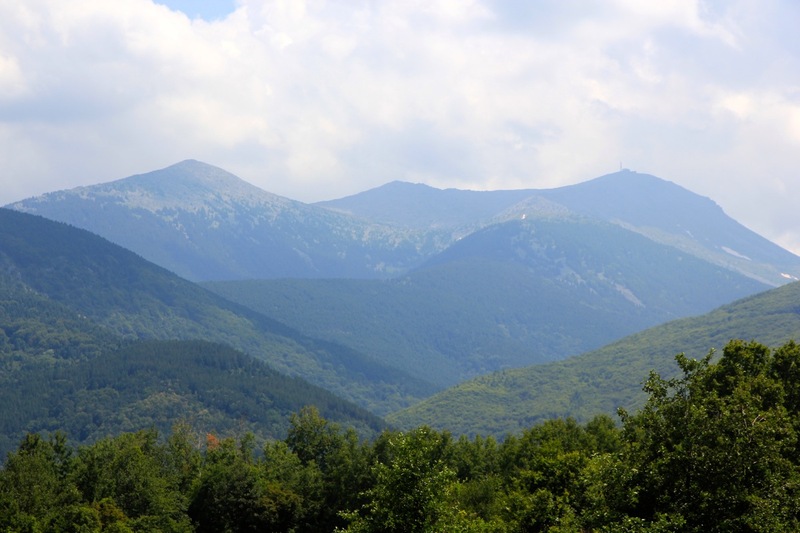 Cross the ski slope horizontally, then proceed on a big trail that will generally traverse the hill, partly descending in order to reach a small rest area located next to the forest road. (The first yellow marker on the map.) This route now continues left along the forest road to the location indicated with the second yellow marker. Here, the trail (well marked) leaves the road and ascends the hillside above. The trail is well marked, there is one trail fork, just stay left (go uphill) at this point. Eventually, after many zig-zag turns, this trail emerges out of the forest and into an open basin below the north ridge. More switch backs will bring you up to a point just below the crest where the north ridge route comes from your left. 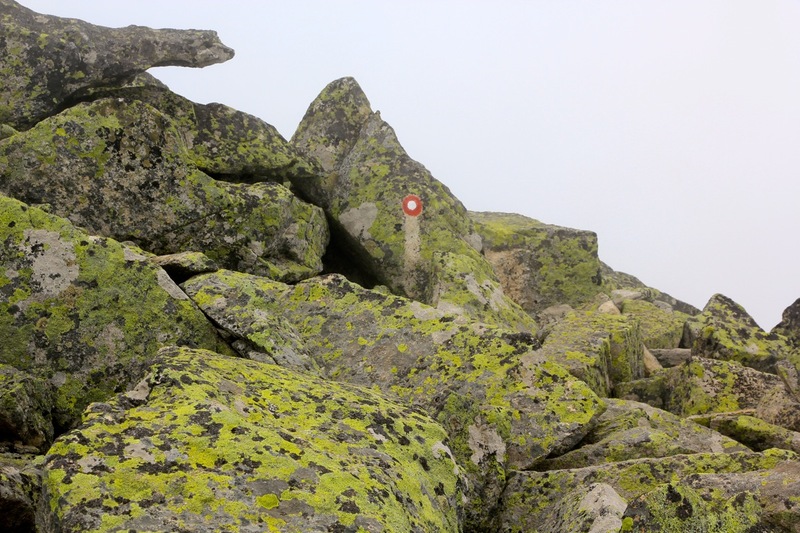 Go right, the remaining distance to the summit is only a couple of hundred meter. 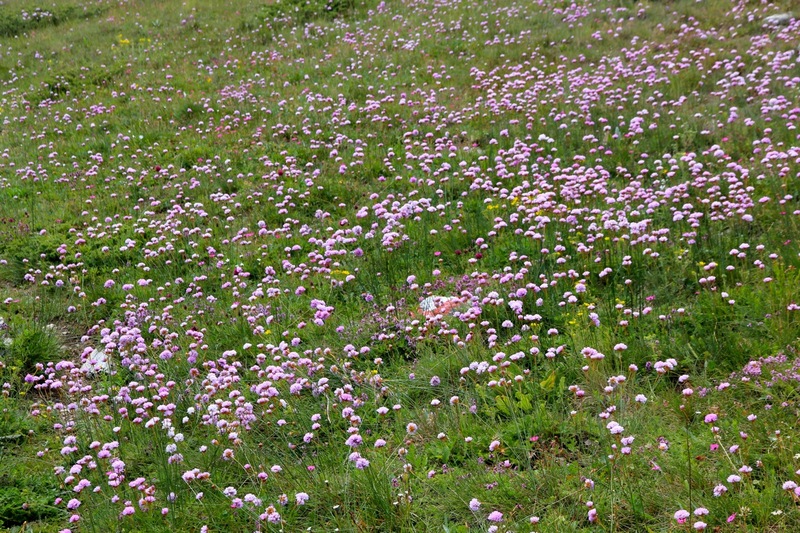 The second option, is to follow the north ridge to the north summit, then continue along the ridge to the main summit. The best option is to locate the same downhill slope at the Kopanki hut, then ascend the ski slope, that is turn left as soon as you are in the ski slope terrain. Continue uphill and you will eventually locate a nicely marked trail (red dots) that has been improved to facilitate a hike alomg a boulder ridge. 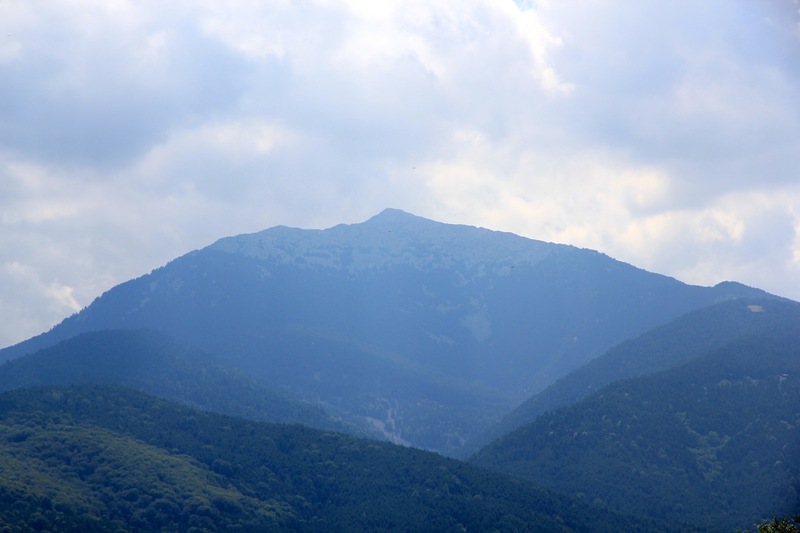 It may be possible to also ascend to this ridge from the east side, however somehow I failed to see this option. Your third option, which is not bad, is to ascend via the east ridge to the north summit, then finish along the north ridge route. See below for a description of this. 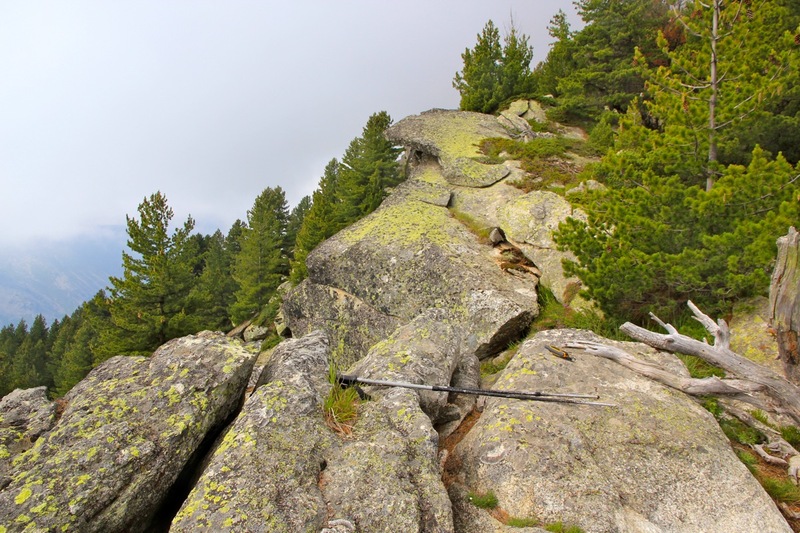 Note that the east ridge is without any trail or markers and that it crosses some sections of terrain with large rocks. Here is an overview of the routes described here and in the comments section below. I left our hotel in Ohrid shortly after 0500 and first tried to access the road to Molika hotel from a small village before the Bitola exit. This turned out to be a mistake and as I drove towards Bitola, I did notice the advertisement for Molika just before the exit. Arriving at the hotel shortly before 0600, I left the car at 0650. I knew that my first goal would be the Kopanki hut, arriving there after only 15 minutes and finding a ruin, I was not entirely certain that this was in fact the hut. 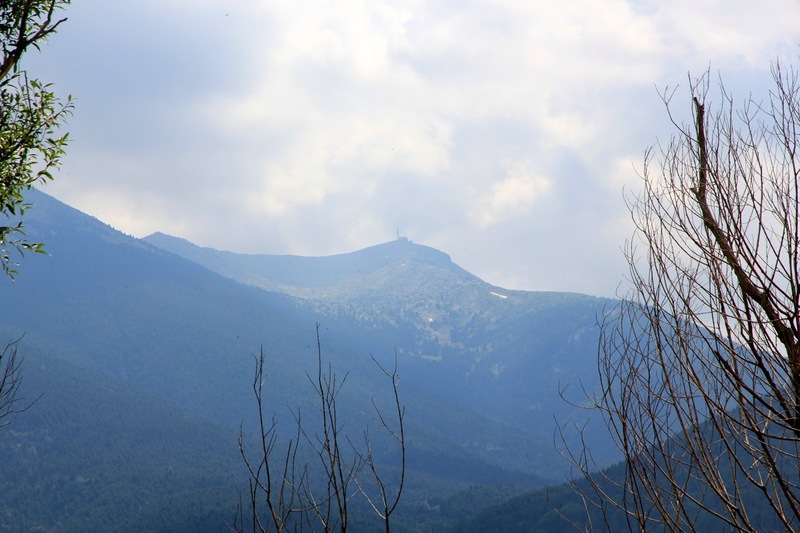 Before exploring any further, I did notice a very clear sign saying Pelister (with local letters), pointing along a trail that went to the left, that is, to the east of the north ridge. There was little reason for me (at this point) to understand that the normal route to the summit runs entirely on the west side of the north ridge and that in fact, this sign was exactly 180 degrees wrong. I proceeded along the trail, quite a good one, but it showed no sign of climbing. It traversed into the first small valley, crossed the creek there and continued on the new hillside. Well, I assumed that the trail would eventually climb this hill. After a short additional distance, the trail emerged on some sort of spur where another trail came from my left. I proceeded uphill, the trail was well amrked but the grass made it look vague. Well into the trees again, and the trail was again very clear. It still did not ascend in any determined way. A new trail fork. My instinct (system one) told me to take the right branch since it headed most uphill. However, more reflection (system two thinking according to Kahneman) led me to check the GPS as well as consider the amount of trail usage. I therefore continued along the left fork. Eventually, this trail turned left and headed downhill in a big way. Too bad, should have listened to my instincts, not rational thinking! I turned back and hiked back to the trail fork, this time turning left and uphill. The trail now looked perfectly OK, it climbed zig-zags and gained more than 100 vertical meter quite quickly. However, another surprise was in store. Arriving at a pretty nice rock having a good view down the valley and the trail ended abruptly. This trail was just serving a local view point! What now? The clouds were all around and the visibility further uphill was very limited. I had little choice at this point, but to continue to follow the ridge uphill. My guess/hope was that this east ridge would meet up with the north ridge on which I knew there should be some sort of route. 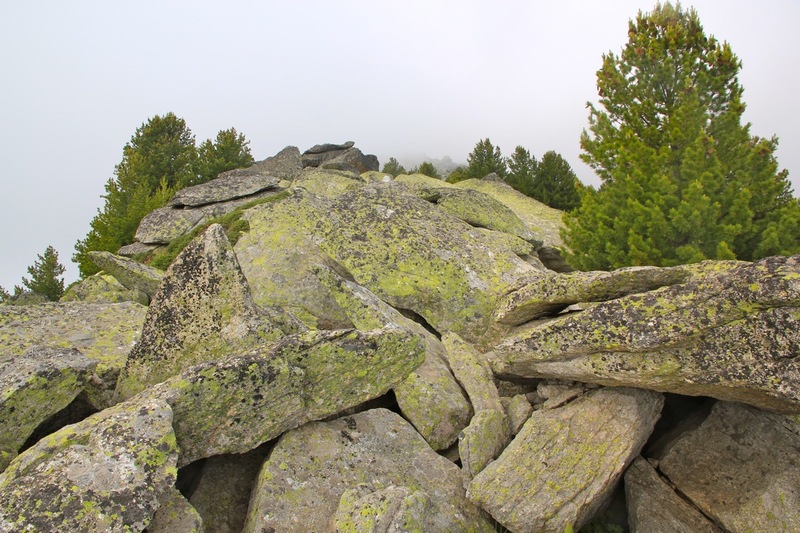 The ridge immediately became a pretty messy heap of huge boulders. Well, a bit of scraambling could not hurt, since this was supposed to be a class 1 hike I had my running shoes. The last time I had used these shoes were on Musala and that had turned into a real ridge scramble. History seems to repeat. I scrambled along and the ridge continued uphill into the fog. The good news was that it did not get any worse, rather it became somewhat easier to follow as I gained elevation. Then, suddenly, I topped out on the north summit and immediately caught sight of a red dot, indicating the north ridge route. Not bad at all, why not complete the trail markers from the view point and up here? I followed the route and it was nice and easy, there were even several spots where small iron steps had been placed to facilitate walking among the boulders. Descending from the north summit, the trail crosses a flat saddle, then continues slightly on the west side of the crest and then meets the normal route, a very clear trail that comes up from the right side in several zig-zag turns. 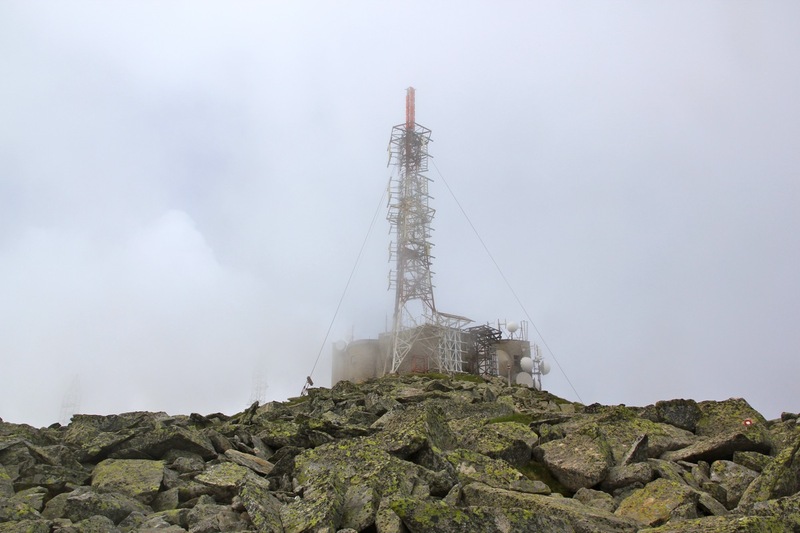 The summit was still in a cloud, thus I did not see it before I was essentially there. The good news was that the sun broke through and the clouds remained below the summit area. I arrived at 1040, that is 3 hours and 50 minutes. Not bad considering my navigational errors. 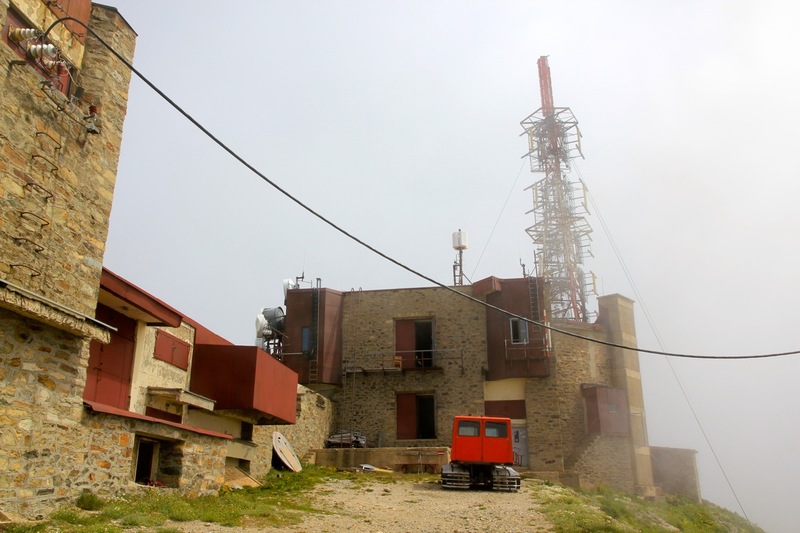 A man soon appeared from the summit building. He was surprised when learning that I was solo. We talked a bit about the mountain and he invited me to sign the visitor register. There were posters from Mont Blanc and Mt. Ararat on the wall. 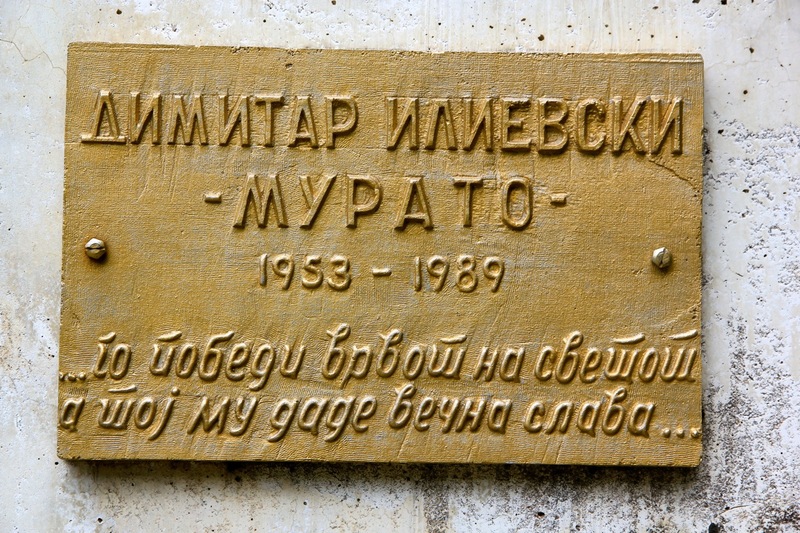 He mentioned that there was a memorial for a Macedonian mountaineer that climbed Everest in 1989, but had died in a climbing accident on the descent. I told him that I had read about the incident while preparing for my trip to Macedonia. "He was my dad", it turned out that the man I was speaking to was Jonce Ilievski, 36 years old and son of Dimitar Ilievski - Murato, the first Macedonian to climb Everest. It took another 20 years before a person from Macedonia climbed Everest, in 2009. In 1989, the mountain was still a place for mountaineering, today Everest has turned into a commercial client and company circus. Small world, I expressed my sympathy with him, today the age of his father when he perished. Jonce was 12 years old when he lost his father. He had later gone on a trekking tour to Everest to see his fathers final mountain. 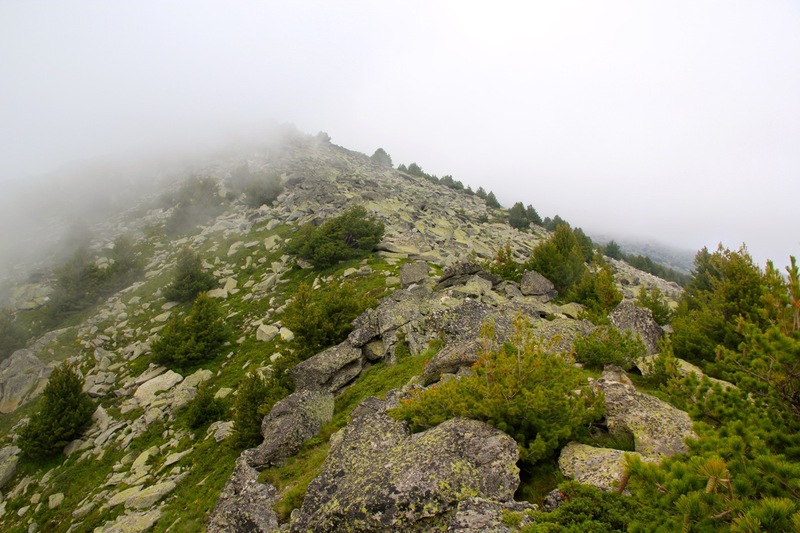 He told me that few people climbed Pelister, the guest register for 2013 was still only a few pages. He expressed quite a bit of smile when telling me that I had opened a new route - the East ridge, when I continued from the view point. 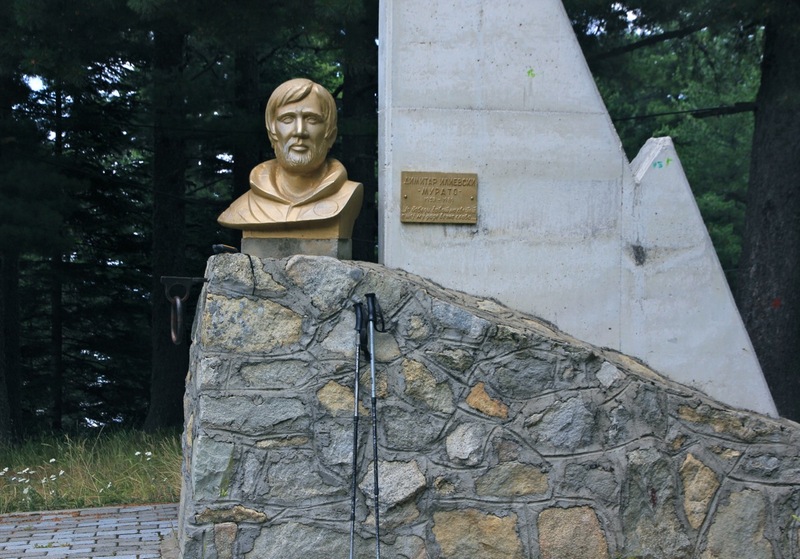 He would live and work one week at the time up here at the Pelister summit, then have a break. I finally wished him all well and goodbye, descending after a 40 minute break at 1120. I walked down the normal route, but decided to make what is clearly a detour up via the Kopanki hut. There I visited the memorial of Jonce's father - he died on May 10th. 1989, my son Pål Jørgen was born only 2 months earlier. different events in different lifes - the long lines and the random meeting, my conversation with Jonce had given this incident a nearness - when I first read about it it was just a matter of history. After this visit at the memorial, I descended back down to hotel Molika and my car, arriving there at 1320. 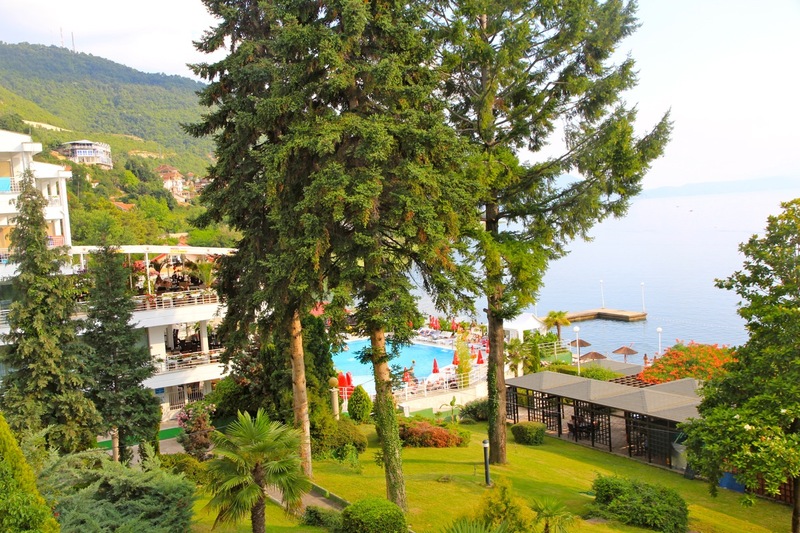 I had a coke at the hotel restaurant and bumped into a Swedish couple, then drove back to my hotel in Ohrid for a nice afternoon swim with Heidi. 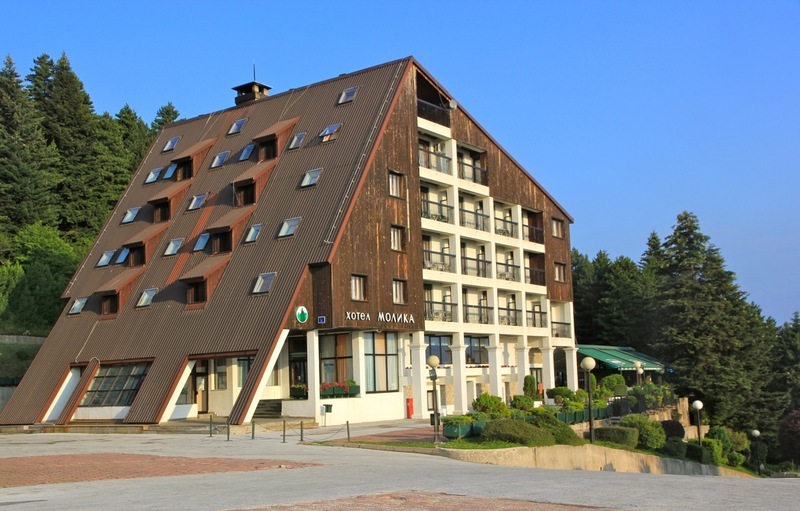 Hotel Molika, the ski slope and the North summit. The North summit. The east ridge (left) and the north ridge (right). The main summit. The ridge on the left is part of the north ridge route. 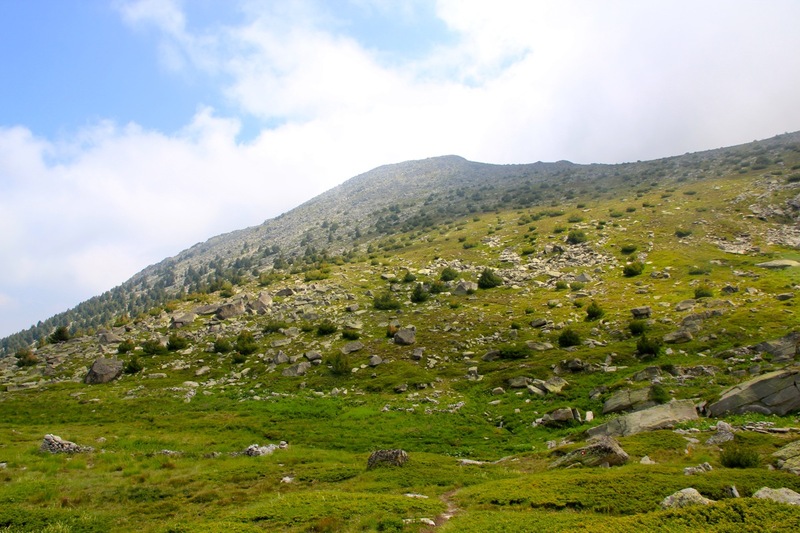 Pelister, the north summit (left) with the connecting ridge. 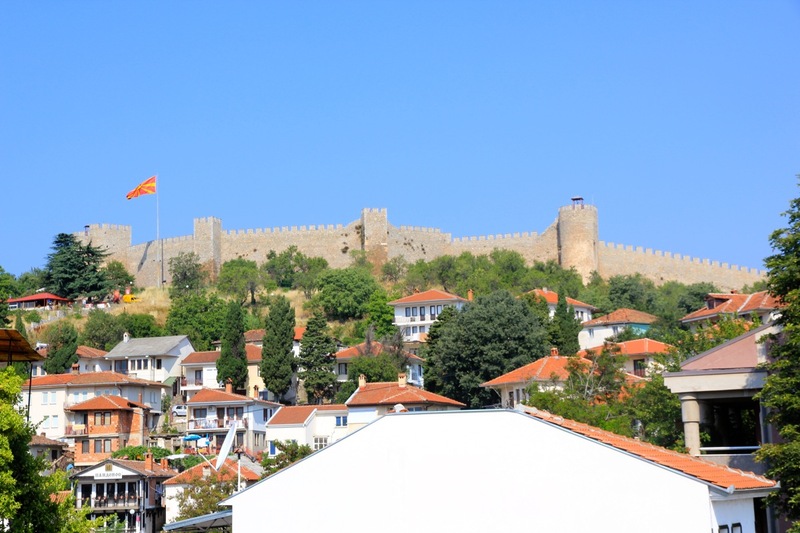 Approaching the castle in Ohrid. 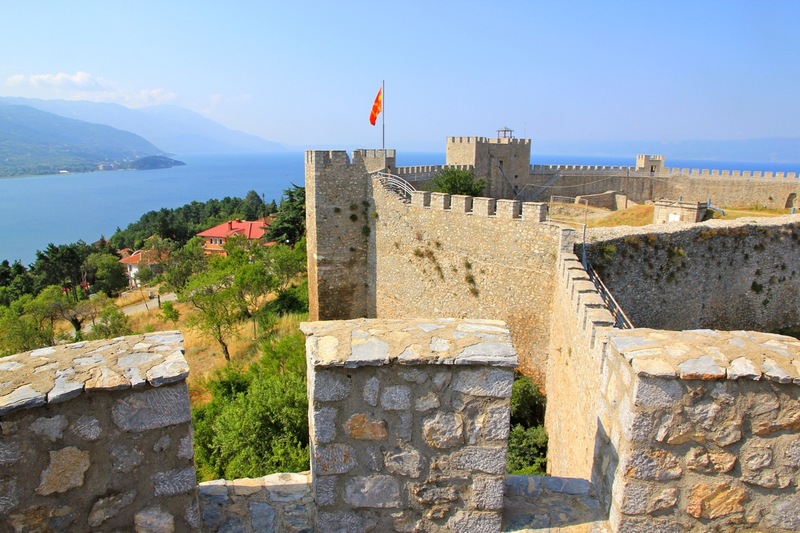 The castle overlooking lake Ohrid. 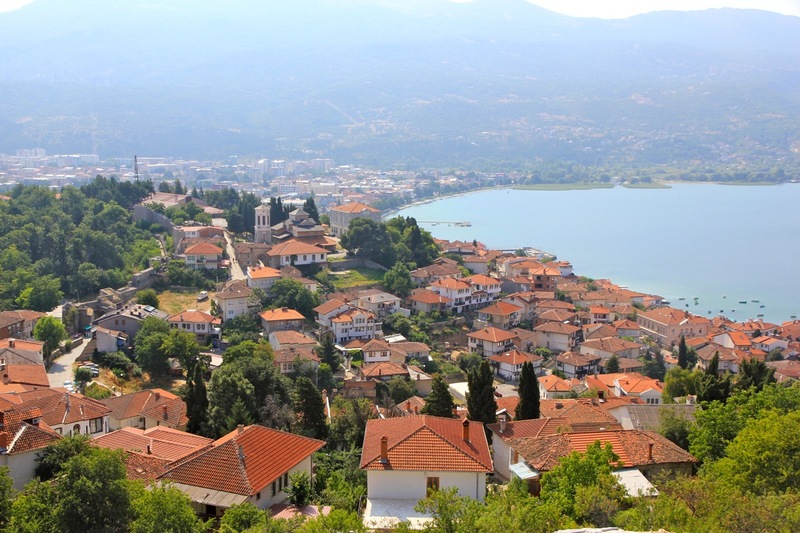 Ohrid, as seen from the castle. 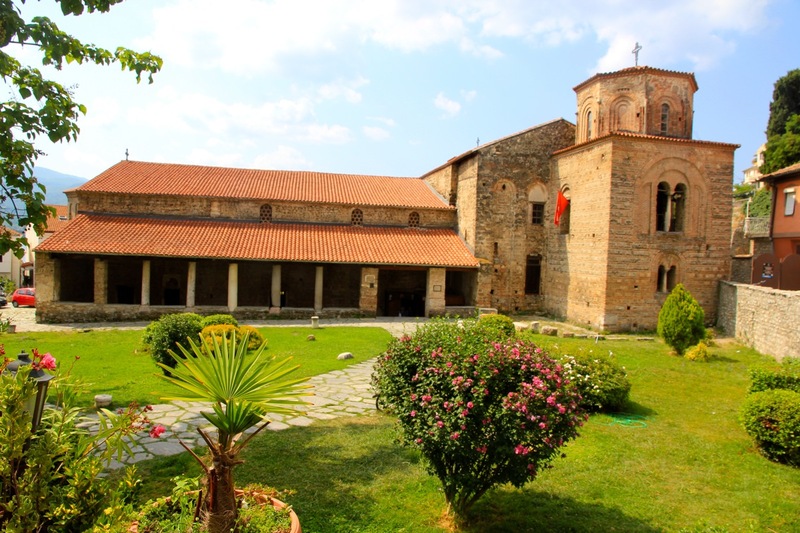 The church of St. Panteleimon. 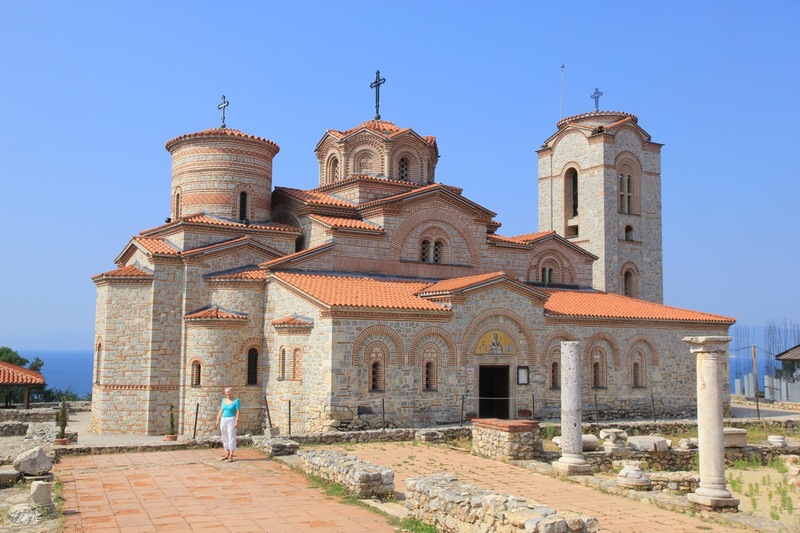 The church of St. Sophia.